President Barack Obama represents the hopes and dreams of the American left, those who call themselves progressive and who view their enemy as conservatives and libertarians, congressional opponents whom they call obstructionists and working private citizens. Who, then, are the real progressives? 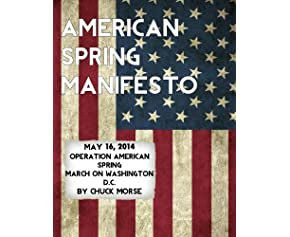 Blacklisted radio talk show host Chuck Morse, the author of American Spring Manifesto, claims that the so-called progressives are actually regressive statist relics of the past who obstruct human and societal progress. He contends that real progressives stand up for the individual under God and for the US Constitution, which protects God given rights. Thomas Jefferson identified this principle when he wrote that The Creator, and not the state, endows us with unalienable rights. In ancient times, the Pharaoh pretended to be the source of rights. He used false idols in his claim of absolute authority to arbitrarily grant favors and mete out punishments. The modern progressives, starting with the Reign of Terror and on to the two great progressive socialist experiments of the 20th Century, Communism and Nazism, sought to re-invent the ancient principle of the Pharaoh, which they dressed in modern pseudo-scientific garb. They replaced the false idol with the virtues of collectivism. Obama reflects the same old regressive hyper-nationalist aspirations as he transfers the inalienable rights of the individual to national and international un-elected and unaccountable entities. This is why the NSA spies on millions of Americans and Obamacare transfers control over healthcare to the state. This is why the Common Core Curriculum nationalizes the minds and souls of our children and Agenda 21 transfers environmental policy from local governments to an unaccountable international bureaucracy. This is why the EPA and Elizabeth Warren’s Consumer Protection Bureau harasses and shuts down businesses. Americans are moving away from the old artificial hyper-nationalist elitist nanny state with it agenda of control over health, welfare, education, population, business, media, and virtually every area of life. Americans both left and right are rejecting the old utopian model. More Americans are self-employed than ever before. The move toward localism, self-government and property rights is underway and is advanced by the personal computer, the cell phone, and other improvements in communication that promote free action. The authoritarian socialistic government with its behemoth web of unelected agencies show their teeth but this is the last ditch effort of a decaying corpse. Let us advance the cause of freedom by exposing their corruption and by understanding how our Constitution, which Obama recently called outdated while attending the EU-US Summit in Brussels, actually works.